Want to see an example of a multi-page website using prismic.io? Look no further! In this project, we provide all the code you need for a personal website with a homepage, information pages, and a navigation. Let's see how to set up prismic.io to get this up and running. As mentioned above, we provide you with all the source code you need to get this example website working. After you set up your content repository we will show you how to configure the code, preview your content, and deploy your site to the web. This homepage will contain a mandatory banner section as well as a Slice zone. The slice zone will consist of a number of templated sections to pick and choose from. This way a content author can independently fill in and arrange their pages how they want. You will only need one instance of the "homepage" type, so this will be a Single Type. In the repository you've just created, go to Custom Types, create a new type, select Single Type, and give it the name Homepage. Make sure that it has the API ID of "homepage". Once created, paste the following code into the JSON editor and save. "placeholder" : "Optional Link Label"
The page custom type will be just like the homepage type, but without the mandatory banner section at the top. It will also take advantage of slices to make creating pages easier and more dynamic. In this case, we will create more than one page, so the custom type will fall into the category of Repeatable Type. Go to Custom Types, create a new type, select Repeatable Type, and name it Page. Make sure that it has an API ID value of "page". Once created, paste the following code into the JSON editor and save. Start by creating three pages: a homepage and two regular pages. Go to Content, hit New, and select the Homepage type. Fill in the content for the homepage banner, then add slices to add the page content. Now, create two information pages. Go to Content, hit New, and select the Page type. Make sure to fill the mandatory UID field that is used for that page's URL. Add some content slices, then save and publish! Next we need to create a custom type that allows the content managers to add and order links in a navigation bar. We will use a group of links in order to accomplish this. We will only need one instance of this custom type, so it falls into the category of Single Type. Create a new custom type, select Single Type, and give it the name Menu. Make sure that it has the API ID of "menu". Once created, paste the following JSON into the type editor & save. "placeholder" : "Select a Link..."
Let’s fill in the menu with your pages. Go to Content, hit New, and choose the Menu type. Give the menu a title, and add all your pages. Click on Link, then “What kind of link do you want to insert?,” select “Link to a Document,” and select the appropriate page. Let’s see if things are working. First, download the website source code. Point it to your content repository API. Check it out to make sure that everything looks good! You should be able to see your working website. Click on the links in the navigation to see all your pages. 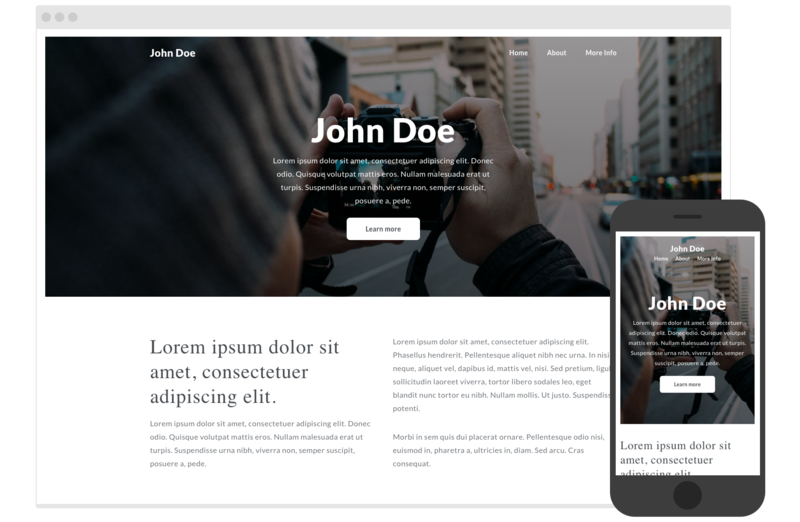 You should easily be able to modify this example site to create your own website: just edit the stylesheets and templates to fit your design.